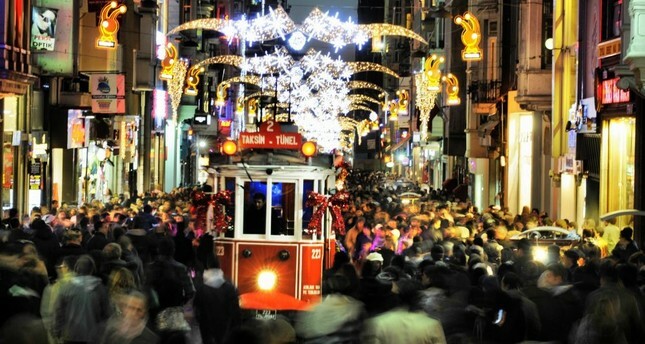 A tramway passes by as people walk on the crowded İstiklal street in Istanbul. Having left difficult periods behind, Turkey's tourism sector has had a golden year. The rapid upward trend in the sector has been quite evident since the first months of the year. Just days away from New Year's Eve, the most populated city in the country, Istanbul, which mostly hosted Middle Eastern tourists on New Year's Eve in recent years, is now seeing a high demand from tourists from Europe, particularly Spain and Italy, who have decided to spend their first moments of 2019 in the city. Although the number of European tourists in Istanbul, one of the tourism capitals in the world, has yet to return to its previous levels, according to bookings for New Year's Eve, hotels in the city are said to have reached an almost 100 percent occupancy rate. Some 90 percent of that is said to have come from foreign tourists. Hotel Association of Turkey (TÜROB) Vice Chair Müberra Eresin said New Year's Eve celebrations are in great demand especially for Taksim Square in the heart of Istanbul and surrounding hotels, according to a report in the Hürriyet newspaper. The city is always full on New Year's Eve but not with the wanted mix. And so, Eresin said some hotels have just started organizing New Year's Eve events for European guests only. "It used to be like this as well. These programs would not open for sale in Turkey. Now it has started again. Hotels in Istanbul, especially the Taksim Talimhane area, will be 100 percent full, while 90 percent will be occupied by foreign tourists. We caught the tourist differences we wanted," Ersin said. According to the data from the hotels, Ersin noted, many rooms were booked from Italy and Spain for New Year's Eve, along with guests from Latin America and Japan. "Apart from these, people come to our country for New Year's Eve celebrations from countries such as Iraq and Palestine." Meanwhile, the tourism sector has experienced a "golden" period this year, overcoming the difficulties seen in previous years, and is very close to ending 2018 with a record number of over 40 million foreign tourists. Turkey closed 2017, which stood out as a year of recovery following a difficult period in 2016, with 32.4 million foreign visitors and $26.3 billion in tourism income with an increase of 28 and 19 percent, respectively, compared to the previous year. The country has hosted more than 41 million visitors, including Turkish citizens residing abroad, in the first 10 months, exceeding the 40 million threshold this year. In terms of foreign visitors alone, in 10 months, 35.6 million tourists arrived - an increase of 22.43 percent compared to the same period the previous year. On the other hand, Istanbul Tourism Association (İSTTA) Chairman Halil Korkmaz noted that Istanbul progressed very well in recent years, saying that in some regions, the hotel occupancy rate exceeded 85 percent for New Year's Eve. "On the occasion of Christmas, the Christian world is more interested in New Year's Eve, especially European tourists. This year, the interest of European tourists returned to Istanbul," he said. "Reservations are quite fine. A good point was achieved in the number of tourists apart from New Year's Eve. Istanbul will host 13 million tourists by the end of the year." Turkish Travel Agencies Association (TÜRSAB) Chairman Firuz Bağlıkaya also spoke of the latest developments regarding the New Year holiday. Noting that ski resorts are among the first choices for local tourists, Bağlıkaya said due to high demand, ski hotels have reached very high occupancy rates. Bağlıkaya emphasized there was increasing traffic to Antalya and North Cyprus for New Year celebrations. "Hotels in Antalya organizing New Year's Eve programs have reached an occupancy rate of 100 percent," he said. For his part, Mediterranean Tourist Hoteliers Association (AKTOB) Chairman Erkan Yağcı said there was quite high demand for hotels in Antalya for the last holiday this year. "Hotels in Antalya have prepared different entertainment programs for New Year's Eve… Occupancy rates in these hotels will be around 90 percent," he noted.